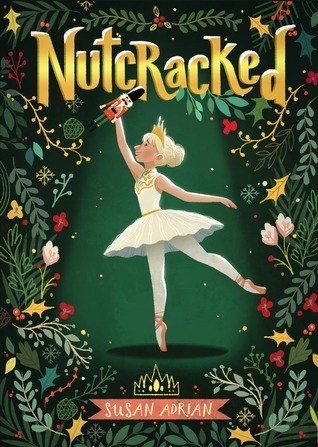 Nutcracked by Susan Adrian, with wonderful cover artStevie Lewis is a little sugarplum of a book perfect for this time of year. Georgie's life is divided, "like the pie charts you do in math." She has won role of Clara in the second cast of her ballet school's annual production of The Nutcracker. She is over the moon, having felt a special connection to this ballet since she was five years old and her grandfather "bought me my green velvet dress and took me to see the show at the Wilson Theater." But, Georgie's beloved grandfather is in hospital, unconscious and now her best friend Kaitlyn has stopped speaking to her and quit ballet. On top of it all, when Georgie holds the antique nutcracker belonging to the head of the ballet school, Mrs. Cavanaugh, née Drosselmeyer, she finds herself transported, in miniature size, to the toy workshop of the Drosselmeyer where the Nutcracker is trapped behind glass in a wooden box, the Mouse King ready to battle. In this magical realm, Georgie learns that a 200-year-spell has been put on all of Drosselmeyer's creations and this year, if they make the right choices, the spell could be broken. Georgie and her new friend Noah explore this realm, trying to help the Nutcracker break the spell while also keeping up with their lives in the real world. There are moments of suspense and danger, but a happy resolution for everyone involved.